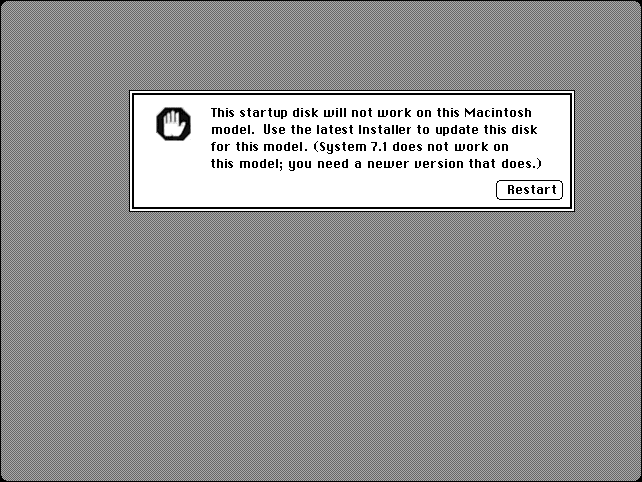 Before attempting this procedure, you should verify that your hardware is compatible with A/UX 3.0.1 - A/UX bypasses the Macintosh Toolbox and communicates directly with the hardware, so if your Mac is not on the compatibility list, you're out of luck. This also rules out any of the current Macintosh emulators - Unless your emulator accurately replicates the low-level functions of the PMMU, FPU, and SWIM chips, it will not work. Before we proceed, I assume you have the A/UX 3.0.1 installation CD, and a boot disk... If not, please check out the "software" section first. 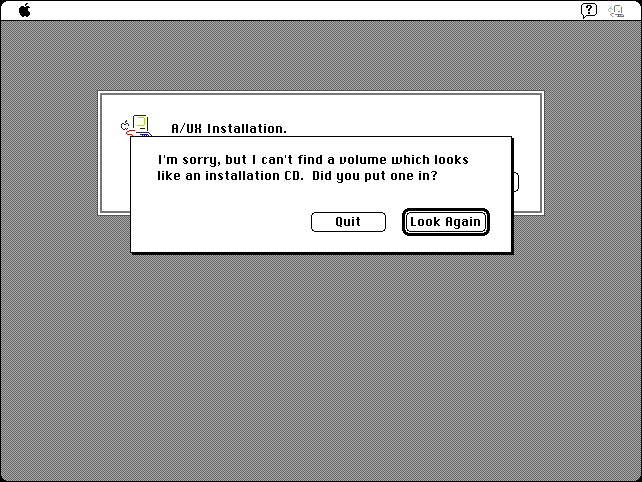 Otherwise, insert the boot floppy and turn on your Mac. 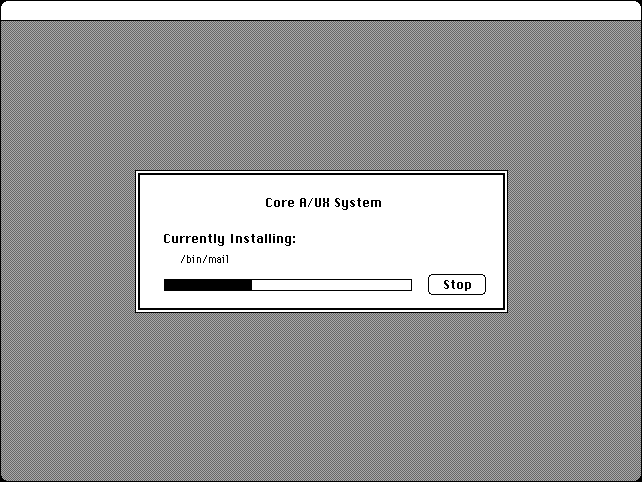 If all goes well, it should boot into MacOS 7.0.1, and automatically launch the A/UX 3.0.1 installer. 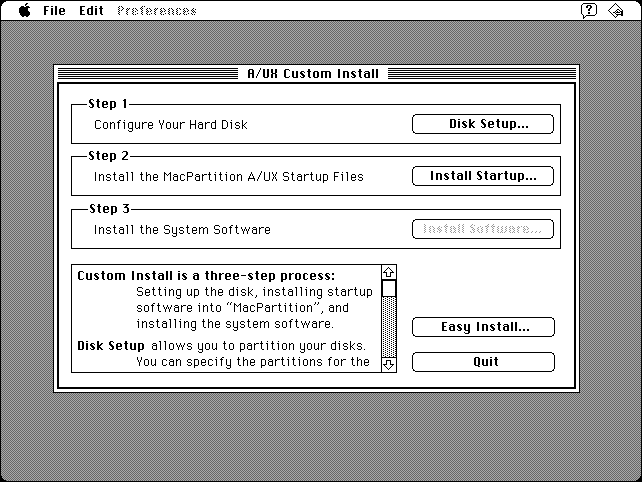 Now comes the fun part - Is your CD-ROM drive compatible with A/UX? Just because it's got an Apple logo on it doesn't mean it's going to work... See the "hardware" section for a list of supported models. If your CD-ROM drive is A/UX-compatible, your screen will go black for a few seconds, then load into the main installation routine. If your screen stays black, you probably have a hardware-incompatibility - maybe a third-party video card. If you're trying to install on an LC475 with a full 68040, this is where it will fail. The video sub-system on the LC series is not supported by A/UX. 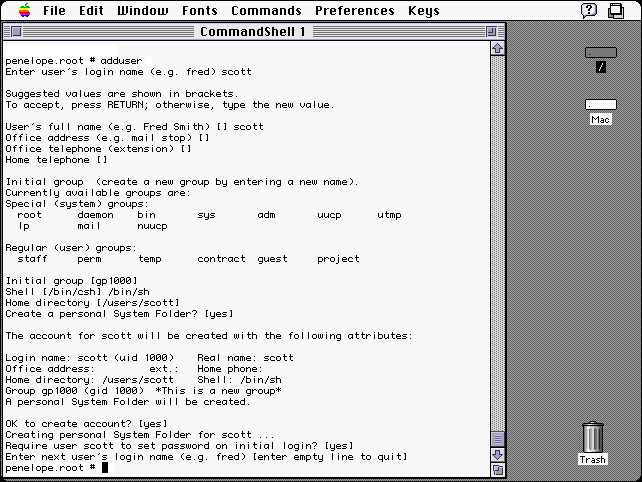 The original Macintosh ROM (bios) was designed to boot into MacOS - This is coded directly into the hardware. 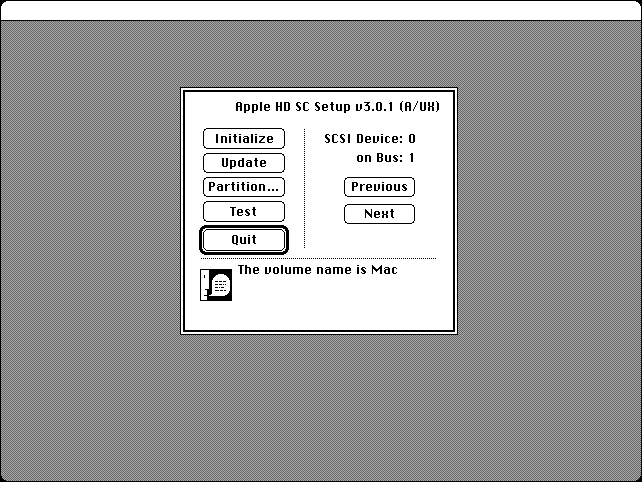 To boot into Unix, A/UX uses a small Macintosh partition with a "secondary bootloader" application. 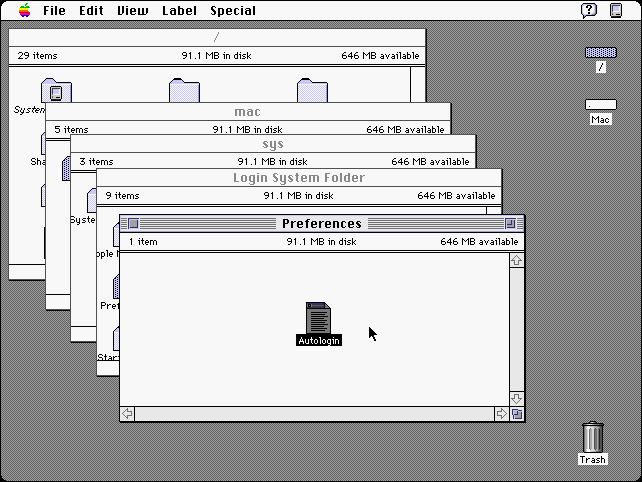 The computer boots to MacOS, then loads into Unix through an A/UX startup application. 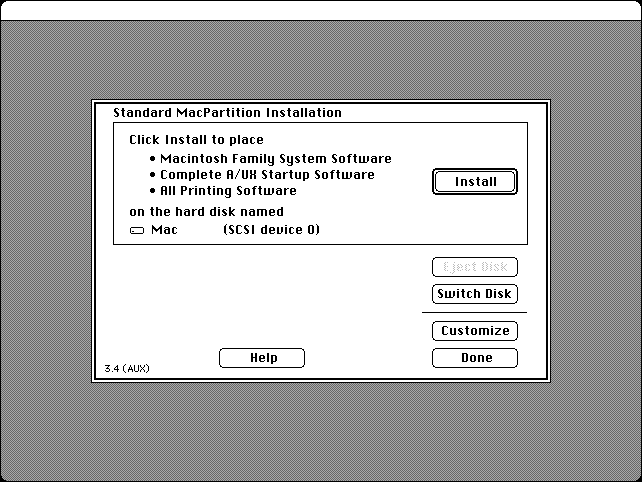 After creating the partitioning scheme, click "Install Startup" to load Mac OS 7.0.1 and the A/UX startup utility into the boot partition. Go for coffee - Depending on the speed of your hardware, this may take a while. 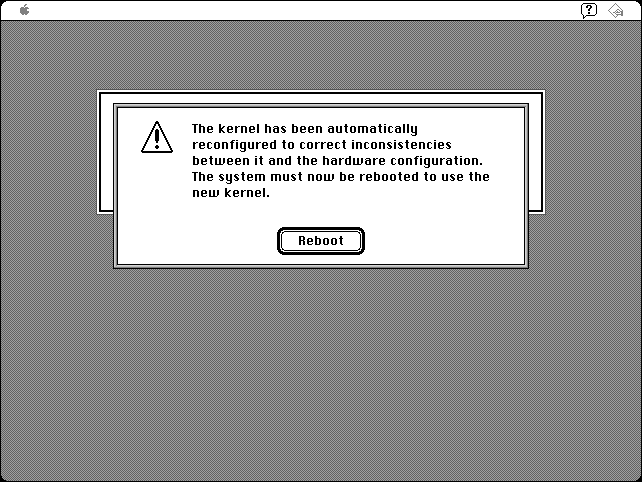 The first time you boot into A/UX, it will automatically rebuild the kernel according to your installed hardware. Reboot one last time and installation is complete. If you are installing A/UX 3.0.1 on a Quadra 610/650/700, or a Centris 610/650, you probably encountered an error like the one below. 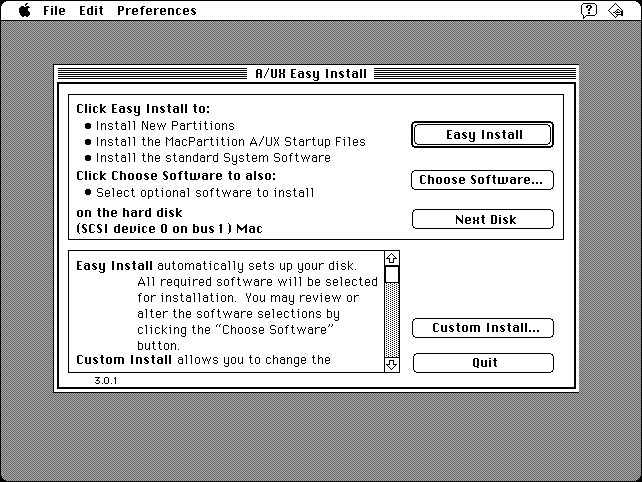 A/UX 3.0.1 uses MacOS 7.0.1 as a bootloader to launch into Unix. Several of the Quadra/Centris models do not support this older version of MacOS - They need the 040 enabler. Boot from this floppy, and copy the enabler to your System Folder. Open a command prompt and type "newconfig" without the quotes. You will be prompted for the hostname, IP address, netmask, and other networking parameters. (Note, A/UX only supports 10Mbit networking, and it does not do DHCP) Don't worry if you mess it up. You can always change the settings later. After you change the settings, you will be prompted to reboot. You can set the default route in /etc/rc by adding the following line. Of course, you will need to change to IP address to reflect that of your gateway. If you don't know your DNS info, check the support page of your internet service provider, or just call and ask them. (Note: The file is called /etc/resolv.conf, not /etc/resolve.conf) Reboot one last time for the changes to take effect. First, you should disable the automatic login feature. Delete the "Autologin" file from /mac/sys/Login System Folder/Preferences. Apple Knowledge Base Article 17627. This will force people to log in using a username and password. 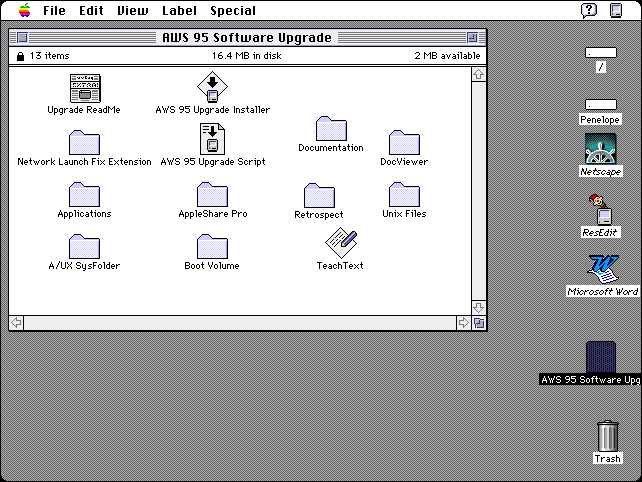 Bear in mind, there is a corrupt copy of the A/UX 3.1 update making the rounds on the internet... A generous user sent me a valid and working copy. That update, and lots of others are available on my jagubox mirror. 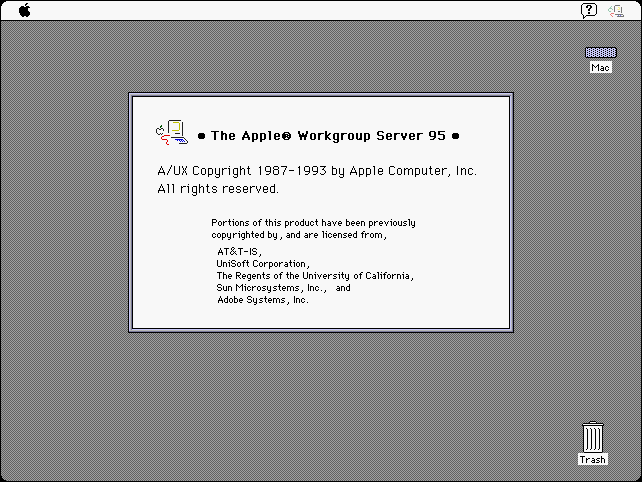 One of the primary authors of the original A/UX FAQ, Jim Jagielski, ran an ftp server back in the early 1990's. This is an updated copy of his original ftp.